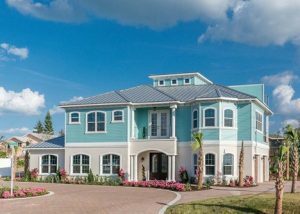 The results are in for the Volusia County Parade of Homes 2019. Newberry Homes is excited to announce that they won the grand award for best Non-Golf Course Community of the Year for the Ponce Inlet Let Key Subdivision. 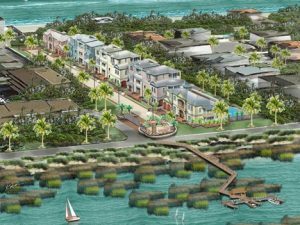 Are you in the market to live in a Key-West style awarding winning boating community? Visit ponceinletkey.com to learn more. 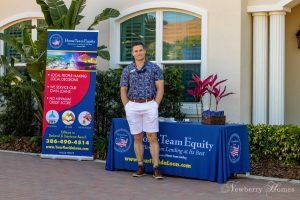 Newberry Realty and Newberry Homes wanted to send a special thank to all of our incredible partners in this year’s street party, held at Ponce Inlet Key during the 2019 Parade of Homes of Volusia County, which took place on Saturday March 23 and Sunday March 24. 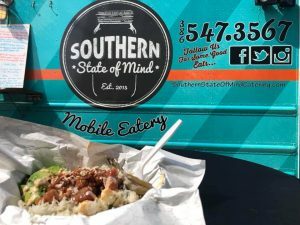 The Hemingway Model won “Grand Award” 1st Place in 2017 for the $500K – $1MIL and “Grand Award” 2nd Place in 2018, and is in the running again this year. Results will be shared on April 12th. 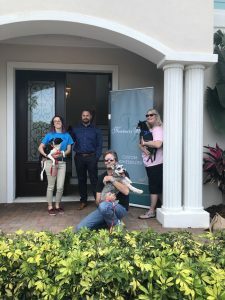 Newberry Realty was onsite to give first hand tours of the custom Hemingway Model, and show off the two lots still available in the award winning neighborhood, while the West Volusia Humane Society brought puppies available for cuddling and adoption, successfully bringing two dogs a new home. 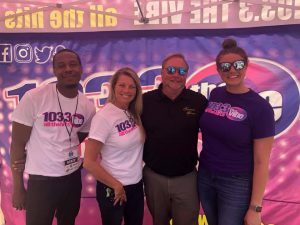 In addition, Kerry Ravi from Allstate Insurance, Cindy Weinberg from Professional Title and Zeke Samples and Britni Malloy from Home Team Equity were on hand to share information about their homebuying support services. For more photos of the fun, please visit the event facebook page. Mallory Construction Update: The windows are installed so the next the phase of construction can begin. This phase includes the exterior finishes such as stucco, paint, siding, and the metal roof. The Mallory will be finished in summer 2019. Ponce Inlet Key only has two lots remaining. Let Newberry Homes build your dream home. Contact us today for more information. 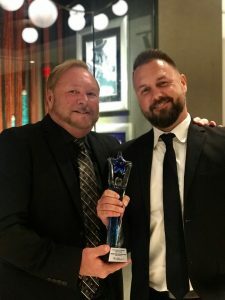 Chad Newberry won Entrepreneur of the Year on On Wednesday, December 12th, 2018 from the Daytona Beach Area Women’s Council of Realtors; Chad is founder of Newberry Homes, Newberry Realty, and New River Aviation. 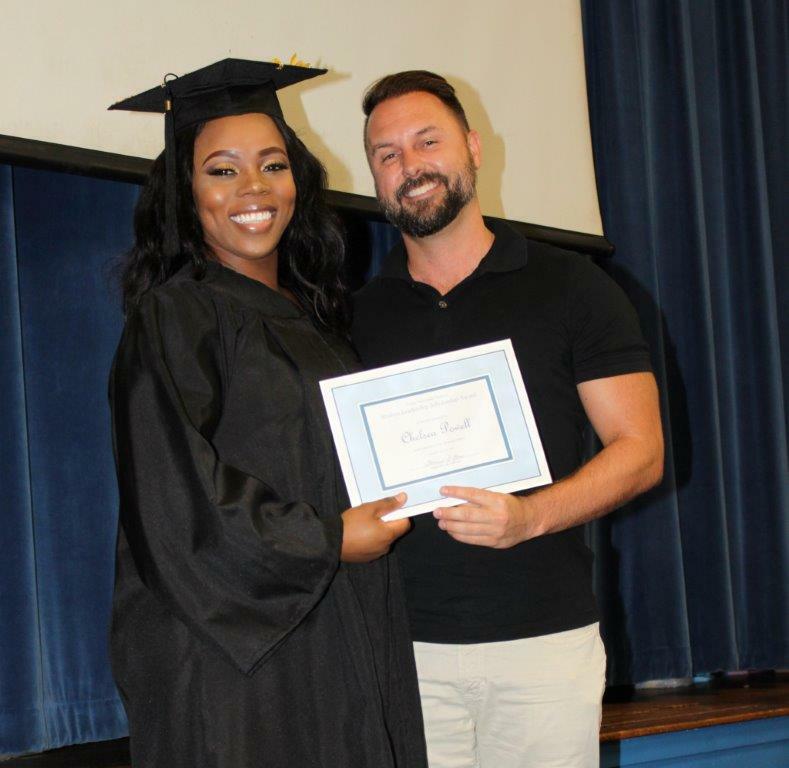 He received this award for his dedication in launching these companies and for his involvement in various community organizations around Volusia County. 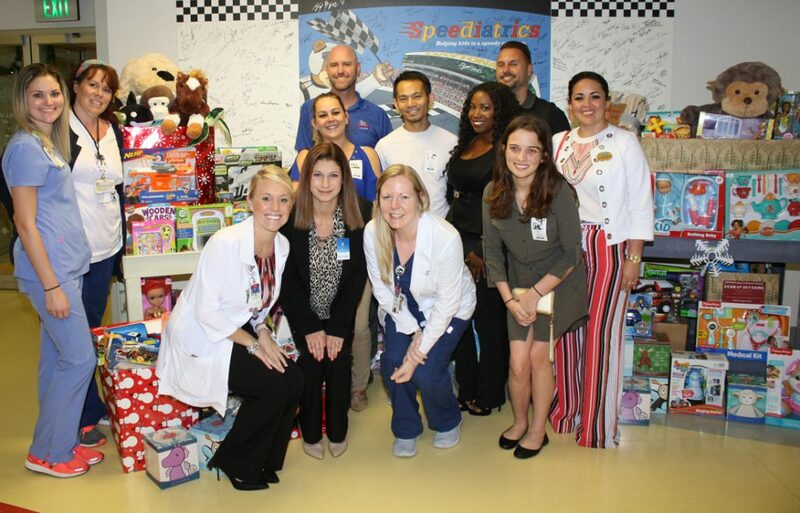 Chad’s community involvement in Daytona Beach includes Women’s Council of Realtors and is the outgoing chairman of Daytona Beach Association of Realtors Young Professional Network. The Women’s Council of Realtors brings together a local network of successful REALTORS®, mostly women, with a focus in advancing their leadership in business, real estate, and the local community. 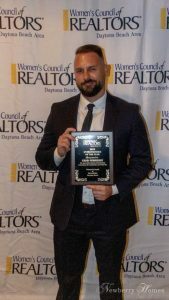 Chad is the founder Chairperson of Daytona Beach Association of Realtors Young Professional Group in 2017 and continued on as Chairperson in 2018 to ensure its success. 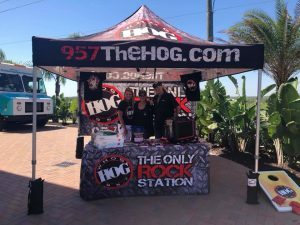 Recognizing the need for an organization to be formed to cater to the Young Real Estate Professional community of Daytona Beach, Chad launched the organization with a focus on: Community Involvement, Professional Development and Networking Socials. This group was designed to expand a REALTOR®’s professional network and contribute to their success in the field and their community. As neighborhoods go, Ponce Inlet Key is to say the least, unique. 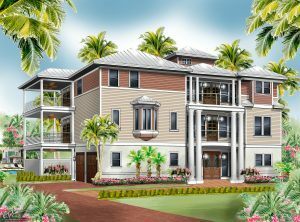 Our signature luxury real estate development, Ponce Inlet Key was unveiled to the public in July. Now, with the community in its final stages, the rare opportunity remains for two additional home owners to enjoy the quintessential Florida lifestyle in this exquisite enclave, with a custom Newberry Home. What is the quintessential Floridian lifestyle, you ask? We think the answer is having an all access pass to sweeping ocean and Intracoastal views and easy access to both, with graceful comfort and thoughtful, beautiful design. Our private, gated community features five custom, single family home sites nestled between the Intracoastal Waterway and Atlantic Ocean in Ponce Inlet, Florida. An additional benefit is our private dock and community center on the Intracoastal. The remaining two lots offer design options for a Mallory, Hemingway, Duval or custom home, built with unsurpassed craftsmanship and expert communication. As a family-owned business, we believe that our personal attention and involvement in each project sets us apart from the competition. My father, Michael and I enjoy the art of custom home building. We work individually with each of our clients to provide personalized home designs that have that distinctive Florida style (think: open floor plans for entertaining, sweeping views from roof decks, sunlit rooms from beautiful windows, stately entrances and high quality finishes throughout. We ensure that each of our client partners enjoy the homebuilding process with support from our expert team of construction professionals. The Mallory is our crown jewel capturing the stunning water views surrounding the community, which is why it works so well on the remaining center lots. An extravagant three-story Key West style design with a beautiful spiral staircase and elevator going up the center of the home that exits out to the rooftop terrace. This multi-generational floor plan features five bedrooms (a master suite on each floor), 4.5 baths, a study and more than 4,000 sq. ft. of living. The Hemingway is our mid-size open floor concept, with 3,000 sq. ft. of living space, 4 bedrooms, 4.5 baths, replete with an office, two car garage and rooftop terrace. This expansive 2-Story Key West style home was designed for the whole family to enjoy, with an emphasis on multi-generational living. Featuring 2 Master Suites, one on each floor, it also includes an optional upgrade elevator and panoramic Ocean and Intracoastal Waterway views from the rooftop terrace – the perfect, picturesque setting for entertaining guests. Visit here for a virtual tour. 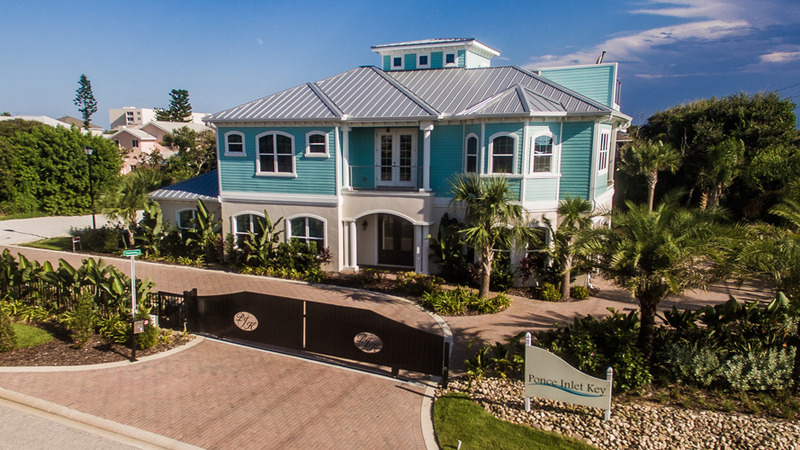 Ponce Inlet Key is a gated, waterfront community of single-family luxury beach homes with access to both the Atlantic Ocean and Intracoastal, created to reflect the quintessential Floridian lifestyle. With a private road leading to the five, custom properties, prices begin in the mid $800,000s. For more information please visit www.ponceinletkey.com or www.newberrycustomhomes.com. 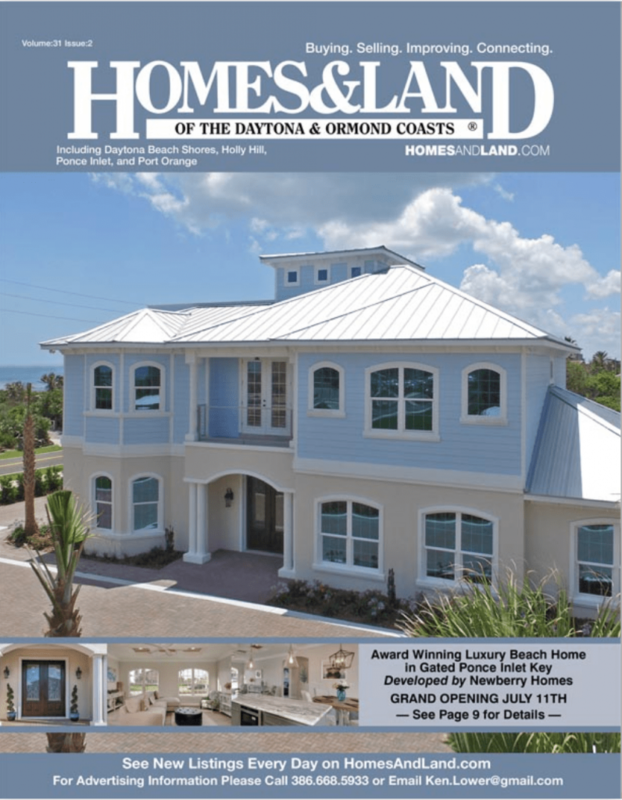 Ponce Inlet Key makes the cover of Homes & Land cover! Click the cover below to see the issue! 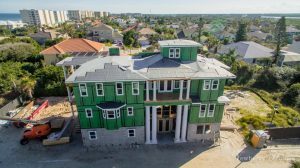 Port Orange, FL – Shortly after being honored at the 2017 Parade of Homes for Volusia County, Newberry Homes sold their first home in Ponce Inlet Key.